Born in Dudley, West Midlands, to Jamaican immigrant parents, Lenny Henry has been a stand-up comedian since 1975, winning the ITV talent show New Faces when he was just 16. It landed him a role on LWT's sitcom The Fosters – Britain's first comedy series with predominantly black performers – and gave him a jump-start on the circuit of working men's clubs and summer seasons, where he would perform impressions and joke-book gags. He eventually quit the show as he found a new outlet in the Saturday-morning kids' show Tiswas in 1978. Although his early appearances did not go down well, he began to create recurring characters such as David Bellamy and Trevor McDonut, which found favour with the young audience. Throughout the early Eighties he continued to perform in summer seasons alongside the likes of Cannon and Ball, while also starting to tour his own show in colleges. Three of a Kind was followed by his first solo show, the Lenny Henry Show, featuring Delbert Wilkins. It has reappeared under various guises over the years, including Lenny Henry Goes To Town, a prime-time Saturday night show in 1998 in which he visited a different UK town every week, and Lenny Henry In Pieces , which won the Golden Rose Award at the 2001 Montreux Television Festival. In the summer of 2007 he returned to the idea of touring the UK, with Lenny's Britain, a comedy documentary made during his live tour. 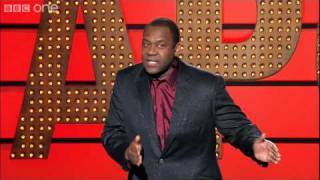 Henry claims to be the first British comic to have made a live stand-up comedy film, with Lenny Henry Live and Unleashed going on general release back in 1989. His other live shows have included In Loud (1994), Larger Than Life in (1996), Large 99 (1999), Have You Seen This Man (2002). Henry also set up his own production company, Crucial Films, whiche made the BBC Two comedy series The Real McCoy. In 1991, Henry made his Hollywood debut in True Identity, in which he played a white man, but the film proved a flop. In 1993 he made the first series of Chef! for BBC One, playing a short-tempered chef, and was named BBC personality of the year by the Radio and Television Industry Club. A second and third series followed. He has also appeared in a number of dramatic roles, playing a drug dealer in BBC One's Alive and Kicking in 1991 and as headteacher Ian George in the BBC One drama Hope and Glory, which ran for three series from 1999. In 1997, Lenny travelled to the Amazon to film a survival documentary for BBC One; and he sailed across the Atlantic Ocean for a two-part documentary, Lenny's Atlantic Adventure, in 2000. In early 2008, he hosted internet clip show lennyhenry.tv for BBC One, and starred in the Radio 4 show Rudy's Rare Records. Henry was made a CBE in 1999 and gained a BA in English Literature from the Open University in 2007. Lenny Henry is to narrate an animated version of children’s picture book Zog for BBC One this Christmas. Tracey Ullman, W1A’s Hugh Skinner and Game Of Thrones star Kit Harington are also lending their voices to the film. Ullman plays Madame Dragon, Skinner is Zog, Jamestown’s Patsy Ferran is Princess Pearl and Harington is Sir Gadabout. Zog is the sixth Donaldson/Scheffler title that production company Magic Light Pictures gave animated.